Seek Consolation In The Sacred Heart Of Jesus! “Place all thy sufferings in My Heart, and I will give them the highest perfection for the utility of the whole Church. Even as My Divinity has united to itself the sufferings of My humanity, in order to make them Divine, so I wish to unite thy sufferings to Myself, in order to render them perfect. Offer them to My love, saying: O Love, to Thee do I entrust my sufferings, with the same intention with which Thou hast brought them to me from the Heart of my God; and I beseech Thee, with my deepest gratitude, to receive them again when Thou hast given them their highest perfection. Thy heart will thus unite itself to the love which makes Me embrace the Cross with My whole Heart, and to the gratitude with which I thanked My Father for having permitted Me to suffer for those I love ; and even as My Passion has borne infinite fruits, both in Heaven and on earth, thy sufferings, even the most trivial, when united to My Passion, will bear such fruits that the citizens of Heaven will receive from them an increase of glory; the just an increase of grace; sinners their pardon; and the souls in Purgatory an alleviation of their pains. And why should not we also, in all, even the most trivial of our sufferings, assure to ourselves the incomparable fruits which union with the Heart of Jesus secured for our Saint? Why should not we also receive them with the love and gratitude which she drew from the Saviour’s Heart? It is so sweet and easy to do so! It is not a question of suffering more, but of suffering better, with more consolation and fruit. We have only to suffer all in union with the Heart of Jesus. May it be henceforth our habitual practice! Keep falling into the same sins? Pray! Rather than provide a theological argument for the importance of (mental) prayer, I will rely on the authority of the Church and the saints. What they say about mental prayer, quite simply, is that it is the means for obtaining all good things: confidence, peace, joy, happiness, humility, conversion, virtue, and the crowning graces, namely, divine love and final perseverance, without which no one can be saved. 1. Ask for the grace to pray well. 2. Put ourselves in the presence of God. 3. Resolve to pray for a certain period of time, despite temptations, dryness etc. 4. Make a firm resolution to overcome a particular sin, or to practice a particular virtue. What do the saints say about mental prayer? the rust of vices disappears. Jesus Is Most Deserving Of Compassion! “I only remained on the Cross of Calvary for three hours, but on the interior Cross of My Heart, my whole life. The monasteries (Oasis) will venerate both of them but especially my Interior Cross which symbolizes these pains and these inner sufferings, so incomprehensible, which constantly oppress my soul. These sufferings remained hidden during My life. I smiled, I labored. Only My Mother was aware of this martyrdom which crushed My loving Heart. My external Passion lasted but a few hours. It was like a gentle dew, a comfort for the other Passion, terribly cruel, which tortured ceaselessly My soul!” (Diary, Sept. 25, 1894). “Some souls do not love Me. That is why they are lost. Among the souls who love Me and call themselves Mine, how few there are who give Me their whole heart! Almost always I receive but a part of their heart. All of it, so rarely! Nevertheless I want them to love Me ‘with all their heart, with all their soul, with all their strength!’ The human heart turns partly toward creatures, toward the world, toward self. Self-love for the greatest part fills it. It lives and breathes only for that. I demand a love which surpasses everything. I have imposed this precept on them to render men happy and to save them. Despite this, how few, I repeat, are the souls who carry out My sovereign will to perfection! I wish them well and they resist. I present them with a treasure and they despise it. I give them life and they run to death. To love and to sacrifice oneself, therein is the eternal felicity in heaven. “To overcome vices and to practice virtues, it is necessary to sacrifice oneself, but do so with love. The soul which does this, love Me wholeheartedly and I will be its eternal recompense. Give Me a love like this, give Me souls who love Me in suffering, who find their joy on the Cross. My Heart thirsts for such a love. I want a pure love, an unselfish love, an expiatory, crucified love, a sound love such as it may be said no longer exists on earth. Yet it is the only true love, the love which saves, purifies and the love I require through My commandments. All other apparent loves do not satisfy Me; all other love is vain, artificial, often culpable, save the love which I have just shown you. When we suffer, let us be content to carry our cross out of love for God. This way “… your sorrow shall be turned into joy.” (John 6:20). It is not within our power to free ourselves from all feelings of anxiety. Jesus Himself experienced such fear and anxiety that He sweat blood! What God asks of us is our love and our trust. He knows what is best for us. If we place our trust in Him and humbly accept our cross (which is an efficacious means of converting sinners), then we can be sure that whatever state God leaves us in is for a greater good, and for His glory. Sometimes healing takes time, so we must be patient. We can be assured, however, that God will reward our faith (remember that growth in virtue is in itself a great reward). Union With God: “An Anticipated Paradise”! The purpose of this article is to inspire us with a greater desire for intimate union with God. Although mystical contemplation is an unmerited grace that God bestows on whom He wills, we may all aspire to the interior life. The joys of the interior life, such as those experienced by the saints, far surpass any earthly pleasure. It would be wrong to seek these gifts as ends in themselves, but as we grow in love of God we will naturally find greater delight in His presence. “My happiness is to reproduce Myself in the souls that I created through love. The more a soul allows me to reproduce Myself truly in itself, the more happiness and repose I feel in it. How do we nourish our Interior Life? What hinders the Interior Life? “THE LIFE OF UNION WITH GOD IS AN ANTICIPATED PARADISE: IT IS HEAVEN ON EARTH, THE HEAVEN OF THE INTERIOR SOUL. The more a soul loves purity of heart, the better is she fitted for converse with God. God acts with the pure of heart as a mother acts with her little babe. “Perfect charity casteth out fear.” (1 John 4:18). When Our Lord asked Sr. Benigna Consolata, a “little soul”, to meditate on Hell, He assured her that they would do so in an atmosphere of love. We will do the same (very briefly), though we will not go into specifics about that dreadful place. (Many would profit, however, by considering their last end, as the saints did so regularly). HE DOES ASK THAT WE ACKNOWLEDGE HIS GOODNESS IN ALL THINGS. This pleases Him greatly. From my own experience I can say confidently- though without certainty- that He will reward you with a greater peace and confidence if you leave your fears and doubts to Him (despite your feelings), acknowleding His sovereign, unchanging goodness. St. Gertrude was wont to do this, and she was very pleasing to Our Lord, Who often filled her soul with immense consolations, which are but a foretaste of Heaven. Consider the faith and love of Mary, the Mother of God and our spiritual Mother. According to many saints and mystics, Mary frequently experienced profound raptures of love, in which she was at times lifted from the ground (a phenomenon that can be found in the lives of the saints e.g. St. Joseph Cupertino, St. Padre Pio, St. Teresa of Avila, St. Gerard Majella, Bl. Mariam etc.). Mary also knew the justice of God well; the number of the saved was even revealed to her (though we are not given to know this number). Although Mary was well aware of the justice of God, she did not doubt God’s goodness. She did not waste time trying to reconcile God’s judgements with His acts of mercy. What profit is there in this? We are assured that (perfect) “charity casteth out fear”; knowledge does not cast out fear. We are incapable of conceiving even a faint notion of God’s infinite goodness. The prison of Hell that God has reserved for those who persevere in sin, is far more perfect than the justice exercised in our earthly prisons. It is humility to believe this, because “humility is truth” (St. Padre Pio). Let us humbly accept all trials, including those that confuse and unsettle us, as coming from the hands of Our Heavenly Father. The love and wisdom of God directs all things to good., Who knows better than we do what will be most conducive to our eternal welfare and ultimate happiness! When our Lord showed Sister Francesca of the Blessed Sacrament, a Spanish Carmelitess, the loss of a soul, and several times in a vision compelled her positively to study the separate tortures of that place*, He upbraided her for weeping: “Francesca! why weepest thou?” She fell prostrate at His sacred feet, and said, “Lord! for the damnation of that soul, and the manner in which it has been damned.” He vouchsafed to reply, “Daughter! it hath chosen to damn itself; I have given it many helps of grace that it might be saved, but it would not profit by them. 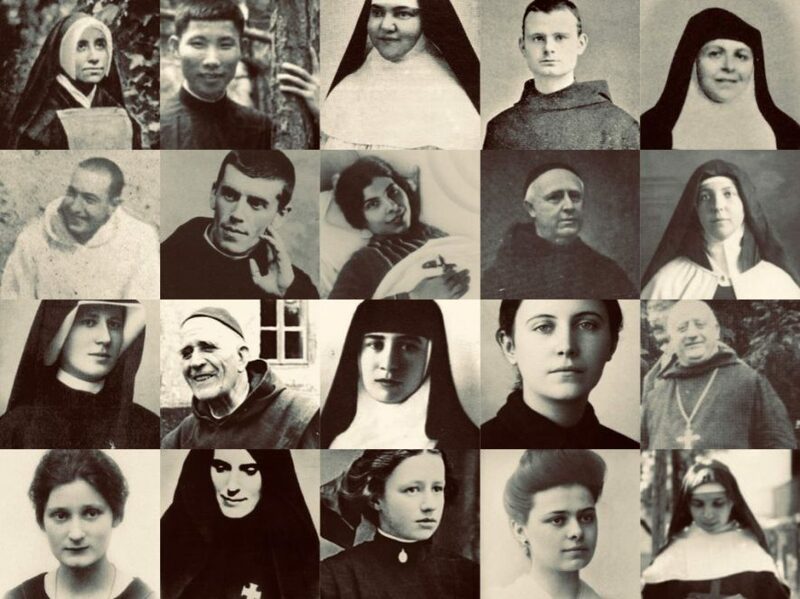 I am pleased with your compassion, but I would have you rather love My justice.” (*We are not all called to do the same; this was not the way of St. Therese, for example). What Gives God “Infinite Pleasure”? The following words of Our Lord to two chosen souls are remarkable! Every Christian (nay, all people) should know them! Our Lord also revealed to Sr. Consolata Betrone that an act of love is so great that the only fitting reward is for God to give us Himself! How humbled we should be, remembering that we cannot love without God. St. Padre Pio said the same thing. The more we have sinned, the more thankful we should be when God inspires us to love Him. What an infinite, and completely unmerited treasure! Thanks be to God! Three Reasons To Have GREAT Confidence In God! Why Practice Devotion To Our Lady? Some of us may doubt that the intercession of Our Lady is necessary or beneficial. The following words are for you especially, but not exclusively. 1. Scripture advises us to. 2. The Saints did, and they advise us to. 3. The Catholic Church, “the pillar and ground of the truth”, advises us to. “Perhaps the saints and the Catholic Church practise devotion to Mary, but nowhere in Scripture are we told to pray to Mary.” If this is your way of thinking, please read on, dear friend. http://www.ewtn.com/library/mary/maryinsc.htm (Unless we have read much Catholic doctrine regarding Mary, including the writings of the saints and Church Fathers, we should remain humble and keep quiet if we feel inclined to object when honour is given to the Mother of God). The words of the Saints and the Church should never be taken lightly; we have a moral obligation to seek the truth, and it would be the height of folly to assume that the Church and its fine fruits (the Saints) had no reason to believe in doctrines like the Immaculate Conception; especially when the Catholic Church possesses Truth itself in her tabernacles! Yes, for Our Risen Lord dwells substantially in the Sacred Host! Deo gratias! Mary in the Old Testament?